Selected papers: Overview of MSWI residue recycling by thermal processes (S. Sakai, M. Hiraoka). The ABB dry ash concept: INRECTM (A. Selinger, V. Schmidt). Evaluation of treatment of gas cleaning from MSWI with chemical agents (S. Mizutani et al.). Recycling for road improvement (Ch.J. Nemmers). Quarries reinforcement with stabilised bottom ashes (A. Bouchelaghem et al.). Integration of testing protocols for evalution of contaminant release from monolithic and granular wastes (D.S. Kosson, H.A. van der Sloot). Study of cement-based mortars containing Spanish ground sewage sludge ash (J. Monzo et al.). Fly ash - useful material for preventing concrete corrosion (S. Mileti et al.). A study of potential of utilising electric arc furnace slag as filling material in concrete (C. Bäverman, F. Aran Aran). Low lime binders based on fluidized bed ash (J. Drottner, J. Havlica). The use of MSWI bottom ash in hollow construction materials (E. Jansegers). Using chemfronts, a geochemical transport program, to simulate leaching from waste materials (C. Bäverman et al.). Verification of laboratory-field leaching behaviour of coal fly ash and MSWI bottom ash as a roadbase material (J.P.G.M. Schreurs et al.). The application of incinerator bottom ash in road construction (K.A. Phil) Acid resistance of different monolithic binders and solidified wastes (J.A. Stegemann, C. Shi). Research and standardization programme for determination of leaching behaviour of construction materials and wastes in the Netherlands (R.J.J. van Heijningen, H.A. van der Sloot). Utilisation of flue gas desulphurisation by-products in the cellular concrete technology (W. Brylicki, A. Lagosz). Influence of the Ca content on the coal fly ash features in some innovative applications (P. Catalfamo et al.). Valorization of lead-zinc primary smelter slags (D. Mandin et al.). Assessment of chemical sensibility of Waelz slag (H.R. Bae et al.). Investigation strategies for contaminated soils in Finland (H.L. Järvinen). Environmental certification of bottom ashes from coal fired power plants and of bottom ashes from municipal waste incineration (F.J.M. Lamers et al.). Quality assurance in the laboratory analysis of contaminated soils (L. Heasman). Contaminated soil - cement stabilization in a demonstration project (J. van Leeuwen et al.). Using environmental economics in decision making and policy formulation for sustainable construction (A.L. Craighill, J.C. Powell). 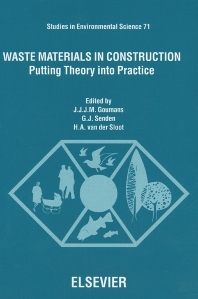 This book presents the proceedings of the 3rd International Conference on Waste Materials in Construction, held in June 1997. The papers presented give the state of the art on leaching of materials and products, demonstration projects and product development. Results of workshops on immobilisation and quality control are also presented. A good overview of the latest results on the application of various materials in construction, based on both technical and environmental data, is provided. The book provides a unique opportunity for environmental researchers, environmental consultants, policy-makers, and those involved in the construction industry to gain the latest information on the subject. For environmental researchers, consultants, and policy-makers, as well as those working in the construction and cement industries and for electricity companies.